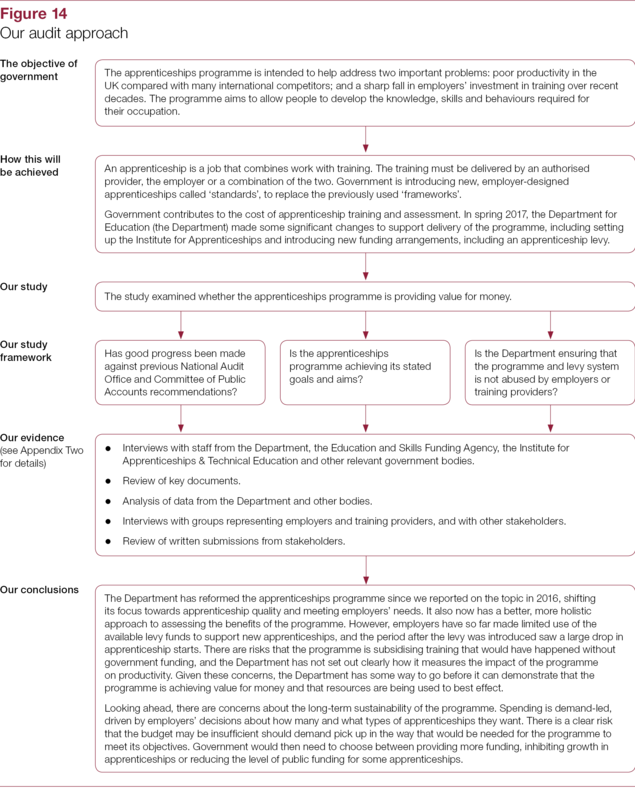 The Department for Education is accountable for the apprenticeships programme, including securing value for money. 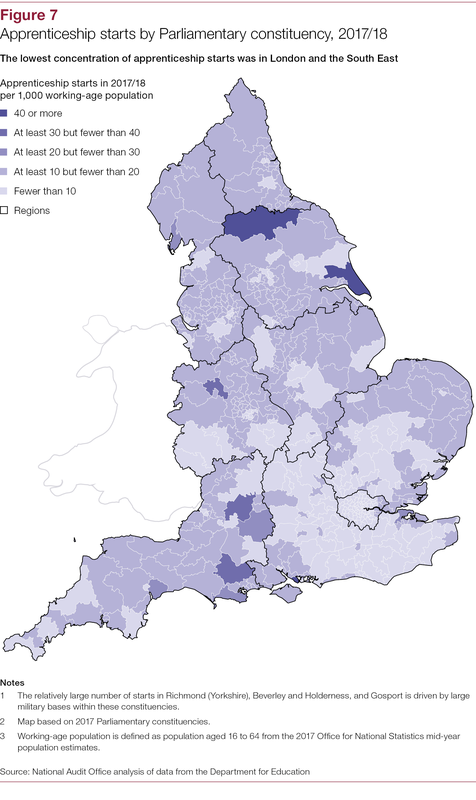 The Education and Skills Funding Agency is responsible for apprenticeships policy and funding, and for overseeing the delivery of apprenticeships. 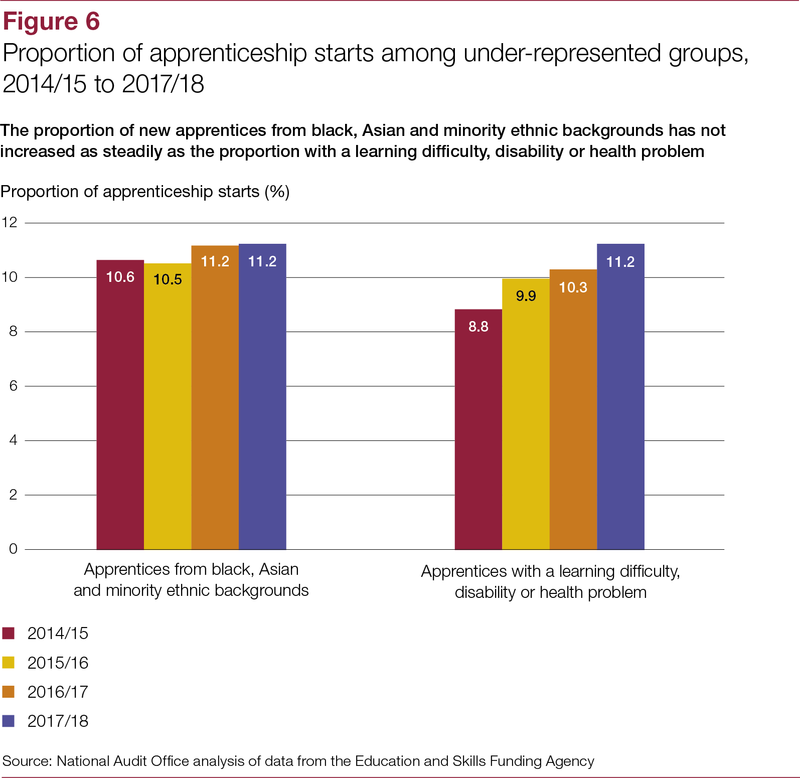 The apprenticeships programme is intended to help address two important problems: poor productivity in the United Kingdom compared with many international competitors; and a significant fall in employers’ investment in training over recent decades. The programme aims to allow people in England to develop the knowledge, skills and behaviours required for their occupation. An apprenticeship is a job that combines work with training. Apprentices can be new or existing employees. Apprenticeships are open to people over the age of 16, and are available at a range of levels, from GCSE-equivalent (level 2) to degree-equivalent (levels 6 and 7). An apprenticeship must last for at least 12 months, and the apprentice must spend at least 20% of their paid hours doing off-the-job training. This training may be delivered by an authorised provider, the employer or a combination of the two. Government contributes to the cost of apprenticeship training and assessment. oversight of the programme (Part Three). 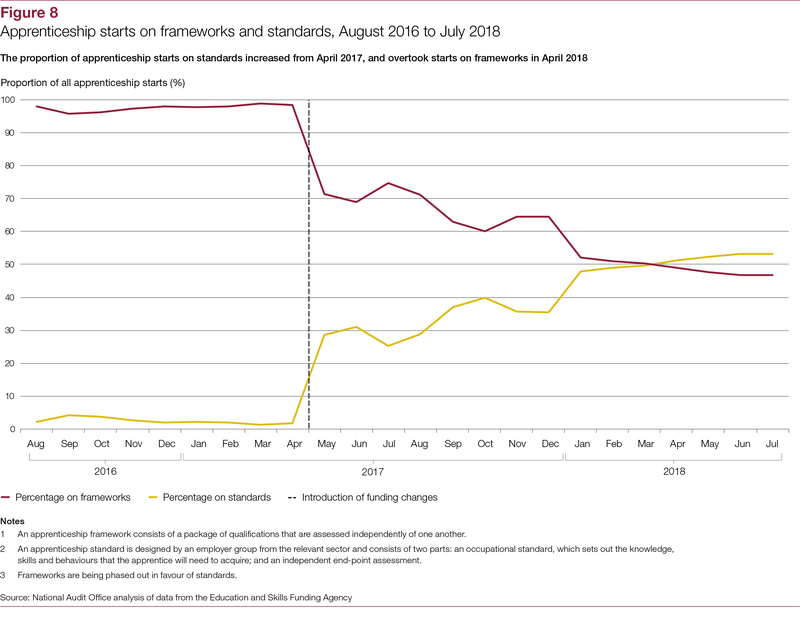 The Department has reformed the apprenticeships programme since we reported on the topic in 2016, shifting its focus towards apprenticeship quality and meeting employers’ needs. It also now has a better, more holistic approach to assessing the benefits of the programme. 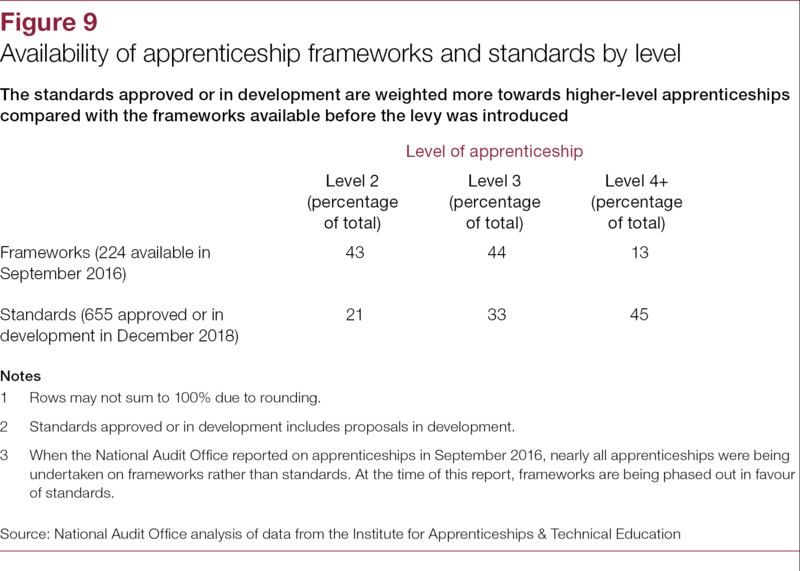 However, employers have so far made limited use of the available levy funds to support new apprenticeships, and the period after the levy was introduced saw a large drop in apprenticeship starts. 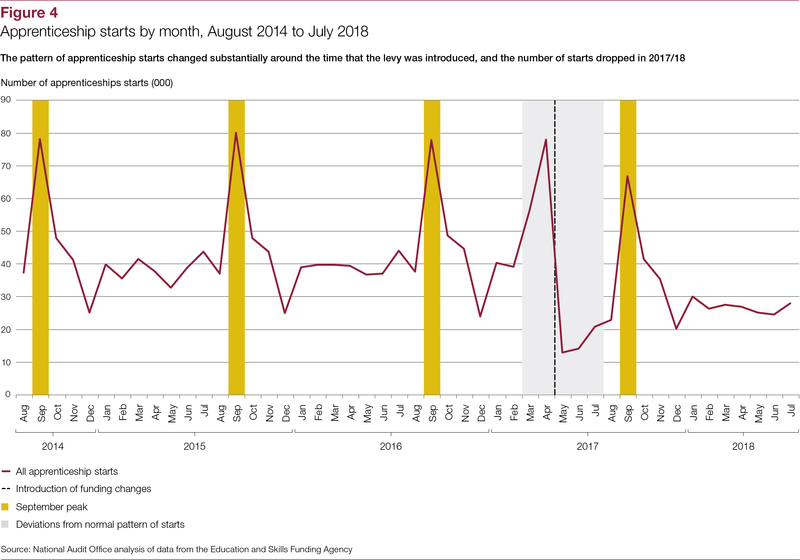 There are risks that the programme is subsidising training that would have happened without government funding, and the Department has not set out clearly how it measures the impact of the programme on productivity. Given these concerns, the Department has some way to go before it can demonstrate that the programme is achieving value for money and that resources are being used to best effect. Looking ahead, there are concerns about the long-term sustainability of the programme. 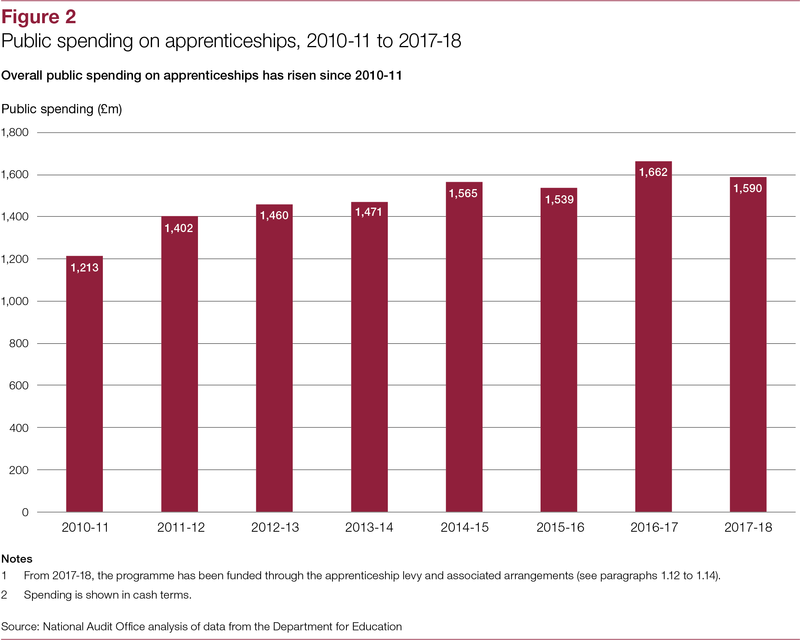 Spending is demand-led, driven by employers’ decisions about how many and what types of apprenticeships they want. There is a clear risk that the budget may be insufficient should demand pick up in the way that would be needed for the programme to meet its objectives. Government would then need to choose between providing more funding, inhibiting growth in apprenticeships or reducing the level of public funding for some apprenticeships. 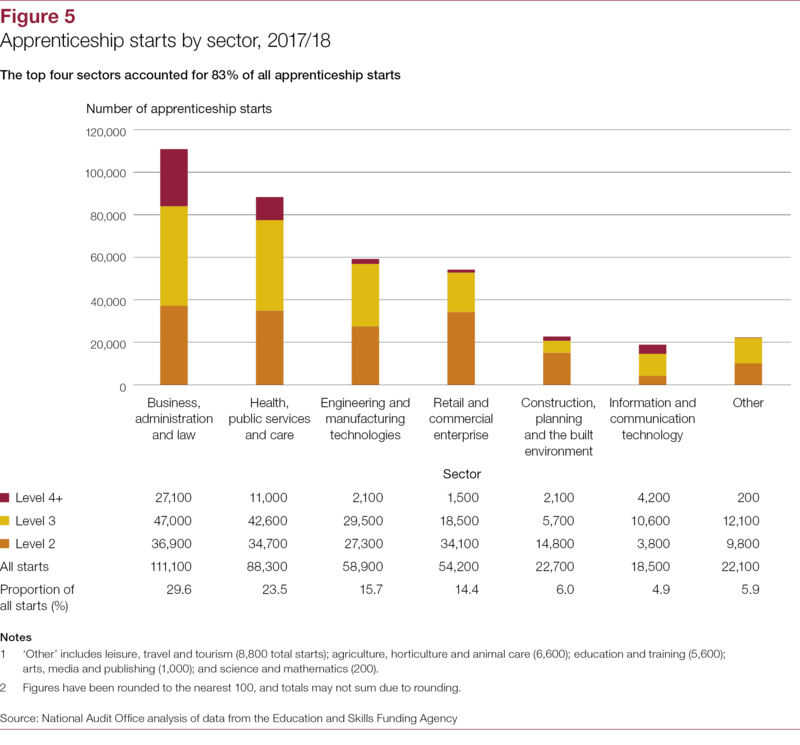 The number of people who have started apprenticeships has fallen substantially since the government introduced changes to the apprenticeships programme in 2017. Find out more in this video.